I loved the fact that Christoper Nolan gave Cillian Murphy a cameo as the Scarecrow in The Dark Knight. I'd love to see more cameo's in the Batman movie series. Maybe even from a villain we haven't seen before like the Riddler, but I've also thought, wouldn't it be cool if the Joker had a cameo? Well, that may just be happening. According to Showbiz Spy Christopher Nolan is planning on using unseen footage of Heath Ledger's Oscar winning performance as the Joker in The Dark Knight. "Chris wants some continuity between movies and for the franchise to pay tribute to Heath and his portrayal of the Joker." What do you think about this news? Should the Joker have a cameo in the new Batman movie? Or should Christoper Nolan leave well enough alone? The Dark Knight rises is pre-production and has release date of July 20, 2012. He should have a cameo! too bad it's just rumours. 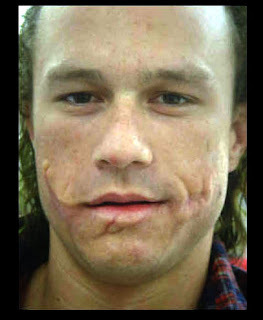 I think for a cameo it would be great, but also give the family of Ledger something for the cameo, because we all know people will want to see the movie also because the Name "Heath Ledger" everyone loves unseen footage. he deserves a cameo for one of the best on screen performances i have ever seen and single handedly making the dark night as good as it was. Although they should respect the wishes of his family if the dont support the isea but i cant see that happening.